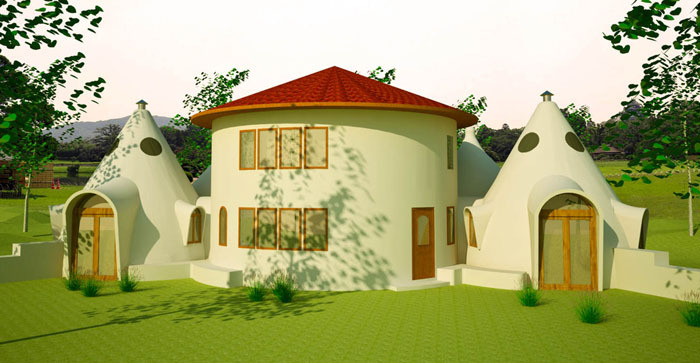 This is a unique design that combines either a roundhouse and various domes, or several round houses, for larger families. There is a 2-story roundhouse in the center with either domes or other roundhouses on the east and west. With the Roundhouse/Dome Cluster there is a possible third bedroom, game room or home office in the roundhouse loft, 2 baths, separated bedrooms, large walk-in closets, dining area next to the windows, and lots of south-facing doors and windows. 1,314 sq. 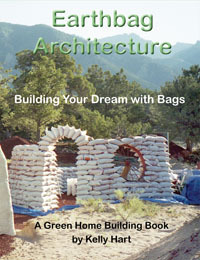 ft. interior including lofts in the roundhouse and both large domes, 2 bedroom, 2 bath; footprint: 31' x 70'. The other version, has three two-story roundhouses (pictured above). There are a lot of things to like about this design: possible third bedroom, game room or home office in the main roundhouse loft, 2 baths, separated bedrooms, large walk-in closets, dining area next to the windows, and lots of south-facing doors and windows. 1,414 sq. ft. interior including lofts, 2 bedroom, 2 bath. Center roundhouse is 24' interior diameter. Bedroom roundhouses are 16' interior diameter; footprint: 31' x 65'.